Today was just one of those days for me. I've been having a lot more of "those" days lately. It is starting to become very apparent to me that my pregnancy with Wyatt is almost over. It seems every time I go out in public anymore, people make the comments like, "Oh, I bet you can't wait to have that baby", or " You're going to have your hands full pretty soon"... I mean, how do you reply to that? I look like I'm a normal pregnant woman. People don't even realize they're stomping on my heart, simply by making such an innocent statement. They aren't trying to hurt me, I realize that... so I come up with replies like, "Your right, I look forward to meeting my son", or "You know, I am thoroughly enjoying this pregnancy with my son. I wish I could just keep him where he is forever". It is really sad for me. I don't even like leaving the house anymore for fear of a stranger's inevitable comment about the baby I am supposed to be holding in my arms very soon. Last week, Joseph and I went to look at recliners. We have been talking about getting some for a while because our couch is pretty much shot. We've been shopping around and finally found a furniture wholesale place that had some decently priced chairs. The gentleman helping us was very nice. He answered all of our questions, and pretty much left us alone until we needed him. After playing musical chairs for about half an hour, we found two that we liked. Before we decided on which chair we were going to get, the salesman went back to make sure he had two of each chair in stock... As he was heading to the back, he told me, "to lay back in the chairs and picture that baby laying on my shoulder"... I tried so hard not to cry. I was just completely caught off guard. We did manage to get my hormones (Yes, I blame all my crying on hormones)back under control before our salesman (I hate that I can't remember his name) returned. And wait, there's more good news... they had both of our chairs in stock so we had a choice in which set we wanted to get! Alright, I'm chasing a rabbit here... back to my other story. Today I got brave and decided to get out of the house for a little while. Joseph was off, so I left Ansley and Eli with him while I went to the store for an ice cream run. I haven't been in the best mind set lately, and as I was heading out the door, I noticed our cat Leo had a very nasty wound on his front leg. I have no idea what it is from, but it looked horrible. I decided I would have Joseph look at it after I got home from the store, but I was mad when I got into the Expedition. I mean, I was fuming. Somehow, Leo's hurt leg, became the straw that broke my back today. The weather wasn't helping with my doom and gloom mood either. It has been a rainy and dark mess these last couple of days so the kids and I have been trapped inside. The sky was looking pretty ominous as I wheeled around the curves of our road, all the while whining and belly-aching to God about how down and depressed I was feeling. I told him that I just couldn't see the light at the end of the tunnel and felt like the darkness was going to consume me if he didn't stop "picking"on me! I had no other motive for talking to God except to vent and whine. 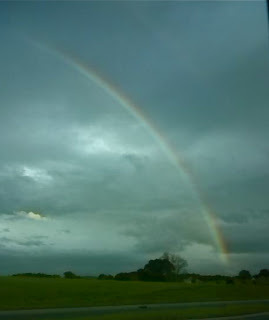 As I came around another bend in the road, there, right in front of me amidst the storm clouds, was the most beautiful and vibrant rainbow I have ever laid eyes upon. I actually pulled my car onto the side of the road so I could just sit and look at it. It didn't dawn on me to take a picture of it with my phone until I started driving again, but I still managed to get an okay picture. I went from whining to God about "poor me", to telling him how beautiful his works are, in a single instant. I have been thinking about that rainbow all day today. It is a symbol of hope. A moment of beauty after a moment of chaos. Have you ever thought about the fact that rainbows almost always choose dark storm clouds as their backdrop? In order to completely appreciate their beauty, you have to go though the storm first. Our family is going through that storm right now, but I have faith in God's will. Sure, I will probably still have more of my "stop picking on me" moments, but I think God expects that. More than that, he EXPECTS me to keep talking to him. So,... I'll keep talking to him and I'll keep walking through this storm. Most importantly, I will keep my eyes lifted toward the heavens... 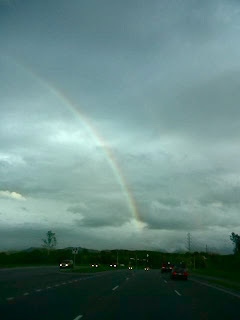 Sooner or later, when we need it the most, God will send us our rainbow. We just have to have faith in God's promise.